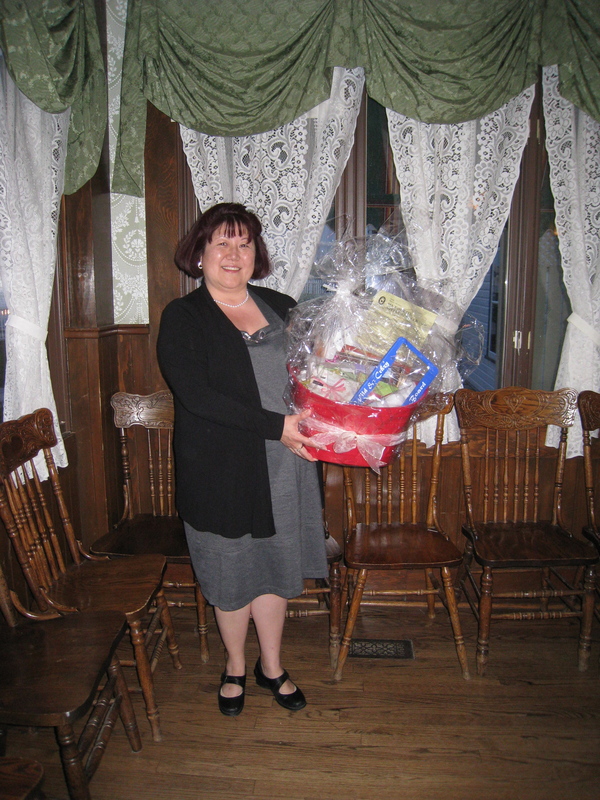 Each year the store sponsors the Festival of Quilts’ dinner at the Wainwright Hotel at Heritage Park. I absolutely love going to this dinner, and am actually giddy driving there. It’s a night of wonderful food, quilting friends, special speaker, and doorprizes. What more could you ask for? Last night, Diane McGregor was the speaker. We listened to her journey as a pattern designer and publisher, and watched her slide show of patterns and personal quilts. She also had some of her quilts on hand to view. The evening always has lots of doorprizes from various quilting merchants. This year our store gave away two doorprizes. One was a basket of quilting goodies valued at over $300. Stella B. was the lucky winner, and Kim J-H was able to take a picture of Stella with it, before she tore into it. Thanks for sending the picture Kim! The other doorprize our store awarded was a pass for all the $13 sessions we are offering this July & August at the store. This includes all our Quilt Alongs, Fusible Applique Workshops, & Hockey Night in Canada Widows Club dates that we have scheduled throughout the summer, and has a retail value of $546. The lucky winner was Kathy Elliot (please forgive me if this is not the correct spelling). Sorry, I don’t have a picture, but I’m sure we’ll see Kathy in the store soon to register for the sessions. It was a great evening, and I’m getting maximum mileage on the corsage by wearing it today as well. It’s been 33 years since I remember having one, so today’s my day for enjoying it! Some of you have actually caught me at the store in my new black plastic dress, faintly Gaga-esque and therefore, oh so stylish. And since the paparazzi didn’t show up to take pictures, you kept on your best poker face and silently questioned if I was suffering from a bad romance or if I was born this way. Until you spotted the paint brush that is, and was given the news that we are moving the store in the next couple of months and how I have a tough time picking colours for the walls and trim. Relieved that I am not any more odd than you originally thought, you may have perused the various cardboards and wall patches I had covered with colours known as Limestone Ridge and Victorian Gold. All colours that I struggled with as they are in the warm zone, since I, personally, love cooler colours for my walls. But since matching the flooring was a higher priority than satisfying my love for teal and all its family members, I stuck with the plan, and tried a few quarts of yellowy-beigey-browney tones. Well, a couple of weeks have passed since I last bought a quart of paint, and I’ve given the chosen numbers to the contractor, along with my choices for flooring, baseboards, cupboards, and countertops. So even though I haven’t thrown out my garbage bag haute couture, I think I’m over the hump now with having to make decisions on the pretty stuff. Since we will have considerably more room than our current location, I am working on a space plan and shelving needs with another contractor. Progress is being made, and in the last four months, I’ve went from finding a new premise, deciding on the square footage, designing the layout, signing the lease, to anxiously watching the plumbing, electrical, and the walls go in. The drywall mudding has now occurred, so I figure we are not too far off now. That being said, we don’t have a firm move-in date, but I know it will be before July 31st. Our new location is more central and on the same street as the Chinook LRT station. Therefore, you can take the LRT to visit us. You don’t even need to cross the street – just walk down 1/2 block south, past the Southside Victory Church. Our building is called Chinook Crossing, and we look at the back doors of Bed, Bath & Beyond and Home Depot located across Macleod Trail from Chinook Mall. This location should make it much faster for our patrons in the northwest part of town to reach us, without adding much more travelling time for the southeast and northeast residents, as they can still take Deerfoot, turning off onto Glenmore. The formal address is 6432-1A Street S.W., and I’ll be sure to let you know when we move there. It will also be posted on our website. Until then, business continues as usual at our current location – you just might spot me in some new garb that is, hopefully, more appropriate for the season. Is it Glad that makes orange bags? And, by the way, your hubby will also probably prefer the new location. Chances are he’d love some browsing time at Home Depot.